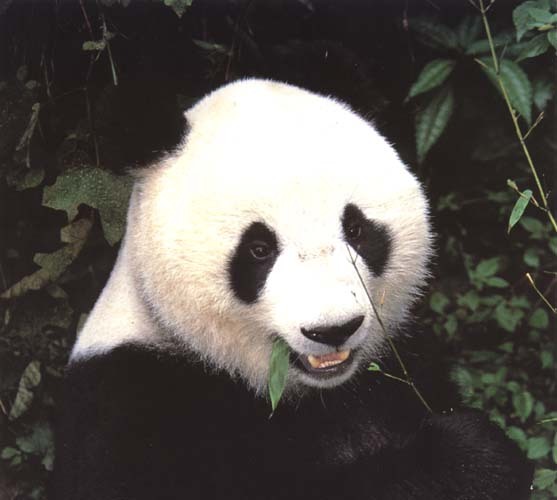 Although giant pandas will eat a large variety of plants, the overwhelming bulk of their diet, over 99%, consists of bamboo leaves, stems and shoots. Over fifteen different varieties of bamboo grow within the region. Because of the giant pandas still quite inefficient intestinal system, it must eat great amounts of bamboo each day in order to get sufficient nutrition to survive. Feeding for 12 to 16 hours each day, giant pandas will consume 10 to 18 kilograms (22 to 40 pounds) of bamboo leaves and stems. When consuming fresh bamboo shoots, the necessary intake rises to approximately 38 kilograms (84 pounds) each day.